Even non-gamers have heard of World of Warcraft, that online game popular among alleged shut-ins and slackers who live with their parents. It stands to reason, then, that even some non-gamers have heard of WoW's developer, Blizzard Entertainment. Blizzard is a PC game developer from way back - they've been in business since years before 3D games invaded the living room, and they've got a reputation for quality which is richly deserved. Though gamers are sometimes frustrated by the amount of time it takes the company to release games, the amount of effort Blizzard expends to polish its products until they glow is both readily apparent and much appreciated. About a month ago, Blizzard released another game: Starcraft II: Wings of Liberty, the anticipated follow-up to the original 1998 blockbuster, has gotten rave reviews and torn up the sales charts, becoming the best-selling PC game of the year in a matter of weeks. 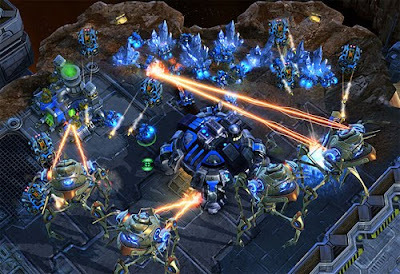 The game is the first in a planned trilogy of games that will further expand and define the Starcraft universe. Rob, Craig and myself have spent a lot of the last month immersed in the game, and I think it's just now that we are really familiar enough with everything that's there to give it a fair shake. After the jump you can find our review of the game's single-player mode; our review of the game's multiplayer portion will run tomorrow, so be sure to come back! Rob: Starcraft was a space western before it was a thing (Joss Whedon’s Firefly), reveling in the drawl, folk-speak and stubble-cheeked charm of cowboy pulps. The first game, released in 1998, packed a surprisingly compelling story, betraying the player, sacrificing its heroes and sprinkling a handful of campy sci-fi references throughout for some needed levity. Starcraft II sets a darker tone from the outset. 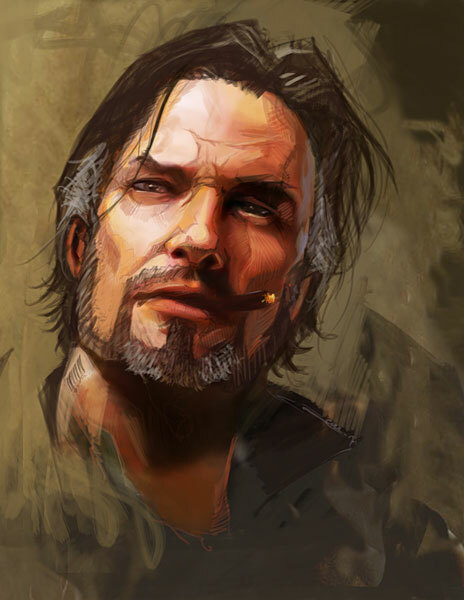 Your hero, ex-Marshall Jim Raynor, spends most of his time drinking. His army is tattered, and his rebellion against space-Stalin Arcturus Mengsk is flagging. It isn’t long before the Zerg, a bug horde led by insect queen Sarah Kerrigan, renews its offensive against humanity. By the way: Kerrigan is Raynor’s ex-girlfriend. Pour him another. Yet again, a game goes for dark, brooding and serious in its sequel, the kind of coup achieved by The Empire Strikes Back. But Starcraft II falls significantly short of Empire’s majesty. Despite a six-year incubation, the dialogue is stilted and trite. It isn’t cringe-inducing, but if you prefer the quality penmanship of games like Mass Effect 2, you’ll snooze right through the character development here. The fertile loam of love, revenge and heartbreak are all readily available, and it’s too bad they aren’t better utilized. Take heart: the game’s finale is affecting, in a John Wayne sense. Hopefully, we’ll see more of that in the series’ coming iterations. 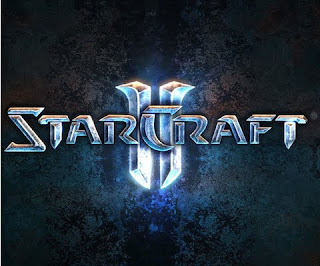 Let’s get this straight: Starcraft II is Starcraft. 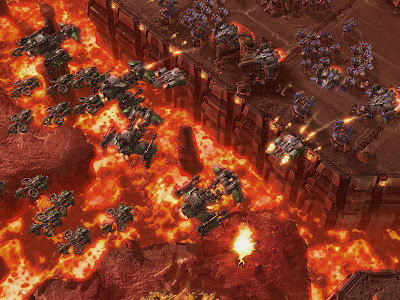 The RTS genre is little-evolved since its explosion in the mid-90s. The forumula is much the same in Starcraft II as it was in Warcraft II, granddaddy of Blizzard strategy titles: gather resources, build units, destroy the enemy. A few tactical titles – Company of Heroes, World in Conflict – have tried to invigorate the genre by eliminating harvesting altogether and focusing on action. But the industry-wide anticipation, and inevitable blockbuster success, of Starcraft II proves that tried and true wins with gamers. I mean, SC II is retro – you can’t even rotate the camera, really, at least not in 360 degrees. Subtle gameplay variations will force Starcraft veterans to learn a few new tricks, but not many. The unprecedented long legs of Starcraft (it became the unofficial sport of South Korea, where league players can Zerg-rush their way to serious money) might have prevented Blizzard from making any drastic revisions. If it ain’t broke, don’t fix it – but if it’s beloved by millions and millions of gamers worldwide, don’t touch it. Starcraft II is Starcraft. And guess what? You wouldn’t have it any other way. Craig: Just as we saw Rockstar innovate sparingly in Red Dead Redemption without trying to reinvent the wheel, Starcraft II is Blizzard painting a much prettier picture with the same palette it used twelve years ago. "Dirt farming" is still a crucial element of any battle, but the campaign throws enough unique scenarios at you to make mining minerals really harrowing. Lava planets, firestorms, angry Protoss: they keep the action fresh and specific. Only a handful of missions even bother with the yawn-inducing "go and stomp the enemy's base" objectives. Every skirmish ties in directly to the story, raising the stakes on even the most mundane of tasks. You won't look at gas harvesting the same after you've snatched resources out from under the noses of some truly vicious Protoss. Yes, the script is laughable. But the non-linear mission structure engages the player in a way most scenario-driven RTSes neglect. After two or three quick fights, Starcraft II gives you (and your proxy Jim Raynor) options. Do you want to help out the shady, bloodthirsty mystic? Or how about that way-too-interested-in-you doctor? Not only does the story unfold in a manner of your choosing, but your army composition changes after each mission. Secondary objectives provide extra cash and valuable research points used to purchase unit-specific upgrades. Embarking on some missions before others can be the edge in some of the more difficult battles. It's all part of a slick makeover given to an old friend I couldn't be happier to have back in town. This ownership Blizzard gives the player over the story is not without its flaws. Am I really expected to believe that the Zerg are just going to sit and wait while I attack my human enemies? But this is a minor ticking clock quibble and a problem endemic to all non-linear games that attempt to deliver a coherent story. Regardless, the metagame aspect of Starcraft II's story is by far Blizzard's biggest innovation - a far cry from the televisions of talking heads that accompanied all mission briefings in the original. How they handle (or change) this structure for the Protoss and Zerg installments may be what I'm looking forward to the most. Andrew: While Robert and Craig are familiar with Starcraft's races and characters and general setup, I am a stranger in a strange land. Our family didn't have a PC worthy of the name until very late in 1999, and at that point in my development I was far more concerned with Nintendo 64 games than with some PC game that our outdated-when-we-bought-it eMachine probably couldn't even run. My perspective, then, is unique, since I'm one of the seven people who didn't play the original Starcraft. How good a job would Blizzard do, educating players who had never played the original game but were drawn to Starcraft II by the massive success of World of Warcraft? My experience has mostly been positive, but you'll find that there is no single tutorial mission that's going to familiarize you with every unit in every race. The tutorials that are there teach just basic RTS concepts - this is how you move the camera, this is how you harvest resources. As Rob said, all of this is virtually unchanged from my days playing Age of Empires years ago. To actually get into the meat of the game, the finely honed, chess-like balance between the races and the rock-paper-scissors interactions of the individual units, you'll want to play the challenge modes and the campaign itself. The campaign in particular does a commendable job of introducing units one by one, often tailoring certain mission objectives to their particular strengths. By the time you're through, you'll have a good idea of what units do and where they're trained, though you might be surprised when you enter the multiplayer arena and find that many of the units have been stripped out in the interest of streamlining the tech tree. The Challenge modes require you to put your knowledge to the test, asking you to fulfill very specific objectives - destroy a bunch of enemy units with the appropriate counter-unit. Avert a Zerg rush. It is better at educating you about "hard counters" - strategies to employ when you recognize what your opponent is doing. Of course, none of this will quite prepare you for the game's multiplayer mode, where death is swift and experience is the best teacher, but we'll get into that a little more tomorrow in our write-up of the game's multiplayer. See you then!